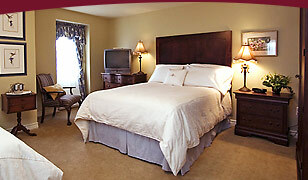 See what others are saying about the DesBarres Manor Inn. A total restoration and reconstruction turned the house into an elegant 10-room country inn with a tastefully appointed bar, a cozy dining room, 600-thread-count bed sheets and a view of unblemished green countryside off the back deck. Next up was a night in the absolutely stunning DesBarres Manor Inn, a 19th century guesthouse which looks like the dream place to hold a wedding. I was treated to a beautiful view of the countryside from my window, and the home-cooked dinner was superb. The staff at DesBarres Manor Inn do their best to create authentic experiences for their guests. They offer guided photography tours with a local photographer, golf experiences that are uniquely fun, cooking classes using local products like freshly caught fish or lobster, and kayak adventures on the pristine waters of Guysborough Harbour. DesBarres Manor’s history, luxury, and comfort make it perfect for romancing. Canada’s Best Romantic Getaways For Valentine’s. Let the romance of the DesBarres Manor Inn whisk you away from reality. A beautifully designed Bed and Breakfast with a seafaring history. Be sure to ask the helpful staff about what to do in the area - for a small town there's a wide variety of activities! In Guysborough at the DesBarres Manor Inn chef , Anna Nickerson, gave us the opportunity to get even more hands on. We both agreed that it was the best lobster we ever had. DesBarres is best described as stately and welcoming. Historic, luxurious and comfortable, it is the crown jewel of Authentic Sea Coast’s family of attractions. Most romantic hotels in Canada. Visitor’s recognize Nova Scotia’s DesBarres Manor Inn for blending traditional elegance with modern luxury. Top Choice for Accommodations. With extraordinary service, fine dining and a range of activities on offer from canoeing and walking to golfing, it's one of the most luxurious properties in Nova Scotia. Inspirational. Inventive. Incredible. The rooms are spacious, the beds incredibly comfortable, and the inn gives you the feeling that you're spending the night with family. Family you love, and can't wait to come back and visit. "Dating back to 1837, this cosy getaway is perfect for couples looking for a romantic retreat. It's a great chance to escape city life and completely unwind." Sometimes it pays to be an early bird. Arrive on Feb. 14 and you can sample this upscale seaside inn's 'Winter Romance Getaway Package'. DesBarres Manor Inn is fast becoming a world-renowned vacation getaway and not just in the height of the summer tourist season. "10 of the Most Romantic Hotels in the World"
Since launching Girls Getaway, I've been lucky enough to lay my head down at a few top dollar hotels throughout the world, but I must say that the bed I slept in at DesBarres was one of the nicest of the lot. DesBarres Manor. Simply. Incredible. The beds are one of the most comfortable I've ever been in. "It's great for couples who picture their marriage ceremony in a scenic seaside location off the beaten track, but still have the luxuries of award-winning cuisine and wine, comfortable guest rooms, and warm maritime hospitality." October 25, 2010 Slightly off the beaten track, DesBarres Manor Inn offers luxurious digs, gobs of architectural charm and delicious, local dishes. Attention girl gourmands. Enjoy the scenic beauty of Chedabucto Bay from the historic DesBarres Manor Inn in Guysborough, Nova Scotia, before learning east Coast culinary techniques from the resident chef and savouring a five-course tasting menu. Top option for accommodation in Guysborough is Des Barres Manor, a gorgeous manor home build in 1837. Dinner is simply exquisite ... I'd encourage you to try all the courses, as this restaurant might be Nova Scotia's secret weapon. The best restaurant in Nova Scotia, I must say, is at the DesBarres Manor, a beautiful manor home turned B&B. With an award-winning wine list, incredible hospitality, and one of the most comfortable beds ever, it is worth the drive to Guysborough just to experience this gem. All in all, this [DesBarres Manor Inn] is the region’s best upmarket accommodation”. "Those herbs and vegetables in season inform a creative, contemporary East Coast Canadian menu which changes almost daily." "Nova Scotia chef uses fresh produce from organic garden to create award-winning dishes." "On the way to Cape Breton, take a short detour south to beautiful Guysborough … and dine and stay at historic DesBarres Manor Inn." "What an exceptional stay. The impeccable service held up to the 4.5 Canada Select stars but didn’t lose the Nova Scotian hospitality." "Travelers planning to explore Atlantic Canada should consider staying at this luxury B&B or oceanfront golf property from Authentic Seacoast Resorts." "Travelers willing to make the trip to this remote getaway can stay in the luxurious DesBarres Manor Inn, where the current owners have been serving guests since 2003." "What better way to spend a romantic weekend than sipping award-winning wine, dining on gourmet food and sampling chocolate?" "Last summer I discovered a wonderful place on the eastern tip of mainland Nova Scotia." "Up the coast from Halifax is the sleepy but charming town of Guysborough. If you are lucky enough to find yourself here, treat your date to a dinner of superbly prepared local seafood and organically grown veggies at DesBarres Manor Inn." "I agonized over which recipes to highlight because they all sounded so mouth-wateringly great." "The stylishly appointed rooms are big city chic meets country charm and comfort." "For those who want to venture off the beaten path, a breath of fresh air awaits in a seaside village." "A trip to Nova Scotia's eastern tip reveals hidden culinary gems." "What truly defines this 1837 manor home is its gracious maritime hospitality." "The DesBarres Manor Inn took me by surprise with its elegance and beauty. This Inn was the crowning jewel of a fabulous trip." "Who knew you could eat this well in Guysborough ...the pheasant was one of the most delicious things I've ever eaten."